I’m pleased to say I attained all three goals, but it took my final trip of the year to attain the elevation gain goal. I met the 1000 mile goal in November, but with only a few weeks left in the year I had 10,000 feet still to go to make the elevation goal. I knew I’d need a trip with some heavy climbing, so Mallorca, Spain was a perfect place to go to get some serious elevation gain in over a relatively short distance because of its steep and high peaks (which surprisingly are not volcanic). As for the calisthenics goal, I will share more about my thoughts on strength training for ultrarunners in another post. The way I came about the elevation goal was that last year I switched from MapMyRun to Strava and upon migrating all of my runs to Strava I checked my profile and noticed I had climbed about 80,000 (24,000m) feet for the year. If I had been tracking my progress earlier in the year, maybe I would have pushed for the final feet. It’s a funny thing about these arbitrary milestones we set for ourselves, but they give yet another way to guide one’s schedule for the year. 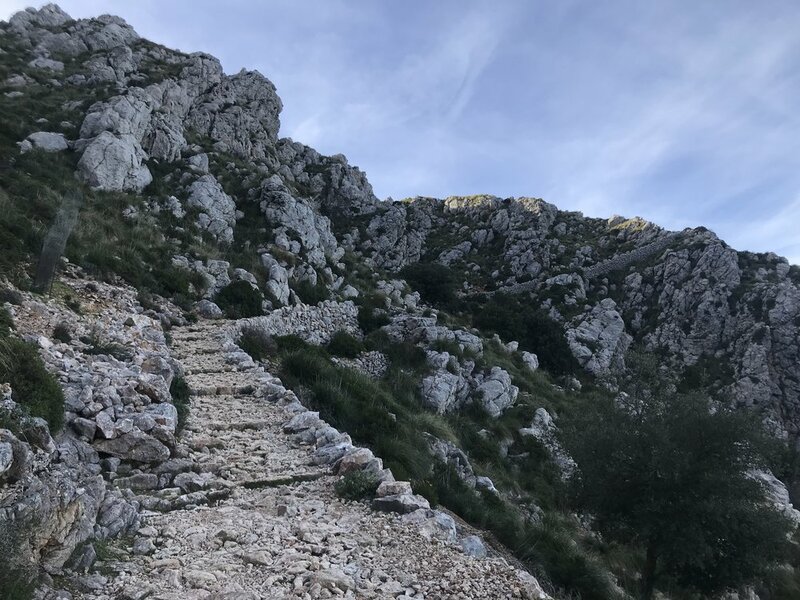 Mallorca and its tall mountains were key for me since I was at 90,000 feet and only had one last weekend where I could fit in a big run before the end-of-year. The run I found on the island is called the Dry Stone Route, otherwise known as the GR-221. In two days I covered 46 miles (74 km) with 10,500 feet (3200m) of elevation gain. On the first day I started early Saturday morning at 9:15am straight off my direct flight from Berlin with a taxi ride to Pollença where I could pick up the trail. My plan was to get to Sóller that evening, hopefully before dark, where I had booked a hotel. The run started out relatively flat along some country roads and a trail following a stream. There was a light rain, but it wasn’t too cold and I could see the clouds clearing in the distance. After about 4.5 miles (7km) the climb into the mountains began. The trail was well marked and well maintained and runnable. There was also some amazing variation in the terrain, especially the man-made parts with the dry stone track that made its way up the mountain via switchbacks. As you can see in the elevation chart, there were three main peaks, the main one being at about 4,000 feet (1200m). Given that the run starts at almost sea level that’s a good day of climbing. The wow factors on this run though began at about mile 21 (34k) on the final peak at 2800 feet (850m). It was here the descent into Sóller started but also was at the exact moment the sun began to set. The sky was painted in pastels framed within the walls of the pass I was about to descend. I spent a good bit of time just watching the sunset. It was a good thing I had my flashlight for the darkness descended quickly. What really made this run amazing though was that in the final 4 miles (6k) the trail descended almost 3,000 feet (900m) down steep dry stone / cobblestone paths. 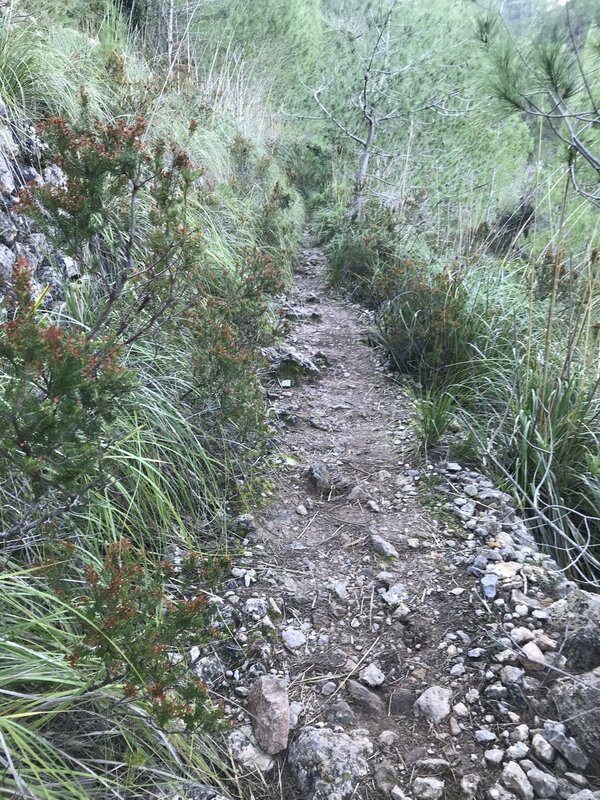 While the trail was well maintained, there were spots where the sides had crumbled away leaving no barrier to several hundred foot shear drops. The entire way down was dry stone pathway, amazing to have a trail like that for so long. If you run this route, be careful of your ankles! The trail wound directly into town and suddenly I found myself on narrow village streets. What a change of worlds in such a short distance. I entered the Ecocrier hotel and while they seemed a little surprised by my appearance; they were happy to see me arrive. I really enjoyed the owners who have a nice place that while cozy also was super interesting visually with unique art. That night they prepared dinner for the guests since the town is mostly shutdown in the winter. Thankfully, I arrived in time as that was the one looming bit of time pressure since I knew if I didn’t make it there likely were few food options in town. After a pleasant night sleep in my super comfortable room, day two started with a big breakfast at the hotel. After having the hotel owners help me secure a cab for later that day from Valldemossa to the airport I was off. At the time I thought I’d have plenty of time to make it to Valldemossa for my taxi, but that turned out not to be true. 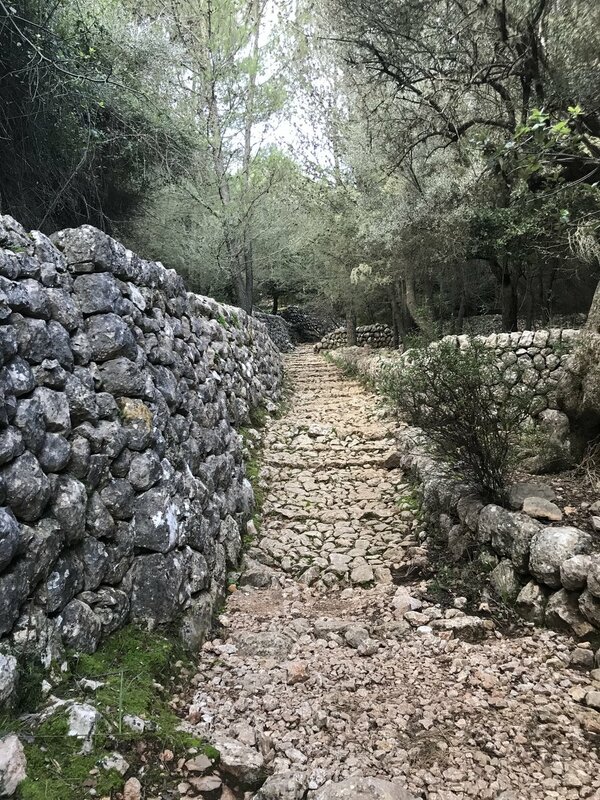 To get to Valldemossa from Sóller you have to climb two mountains. The first peaks out at about 1000 feet (300m) and the second at 3000 feet (900m). What is cool about the run is after the first peak you descend back to sea level where you are treated to some amazing views of the ocean from the steep cliffs. Just off the coast are unique rock formations and water so clear you can see the bottom. After taking time enjoying the waves crashing on the shore, I turned around for the 6 miles (10 km) climb to 3000 feet (900m). Almost this entire route is on switch backs that go along the dry stone terraces. It was this part that had me awestruck as to the ability of humans to transform the land with little more than their own strength. They built these terraces over a few hundreds of years in the period around 900-1200 AD. From what I’ve read, each generation of a family would build a new terrace. While it’s mostly overgrown with trees now, one can imagine the farms that would have lined the mountain along these terraces. It’s also amazing to think how often the farmers would have had to ascend and descend these as part of caring for their crops. Simply amazing! Day two ended with a 5 mile (8 km) descent of 1800 feet (550m). Parts were steep, and the trail not so good as it was on day one. I really had to push the pace near the end since I’d opted to spend more time along the coast, so would only have about 30 minutes to shower before the taxi arrived. While it’d be more relaxing to not have the time pressure, that is one thing that makes these quick weekend trips so fun. In the past when people have asked me what my favorite place to run is I didn’t have a good answer. 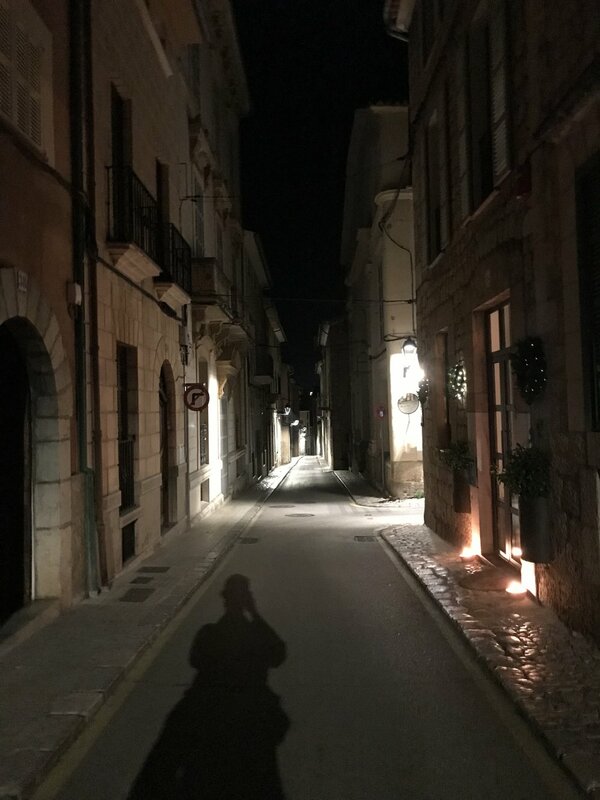 However, now that I’ve run the Dry Stone Route in Mallorca, Spain I have to say its combination of mountain elevation, ocean views, friendly people, unique history and quaint Spanish towns have made it my favorite running destination so far. I hope you can explore this and other ultrarunning destinations! Mallorca, Spain is located off the east coast of Spain and is the largest of the Balearic Islands. I only realised what a large tourist destination it is when it took me 20 minutes to walk out of the very large airport. The airport gets nearly 30 million passengers a year (which to put in perspective, is more than Dublin, Ireland gets). With convenient, and cheap flights, from all over Europe, this makes for a great destination whether you live in Europe or are just there for a short time. I made this trip in about 36 hours with a 6am flight out of Berlin on Saturday morning and returned on a 7pm flight Sunday night. From the airport to Pollenca was less than an hour drive, so if you have just your running backpack you can be on the trail in no time after wheels down.